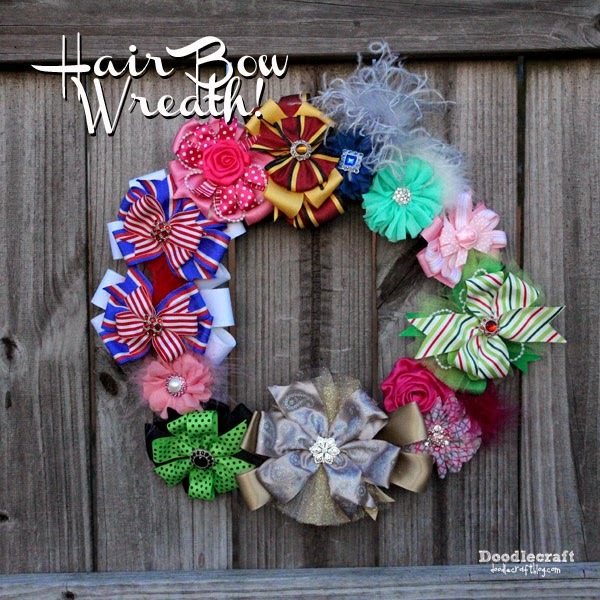 Doodlecraft: Shabby Chic Boutique Hair Bows! Shabby Chic Boutique Hair Bows! Or, seriously, any other day of the week! It doesn't have to be a special day to wear something fabulous in your hair! 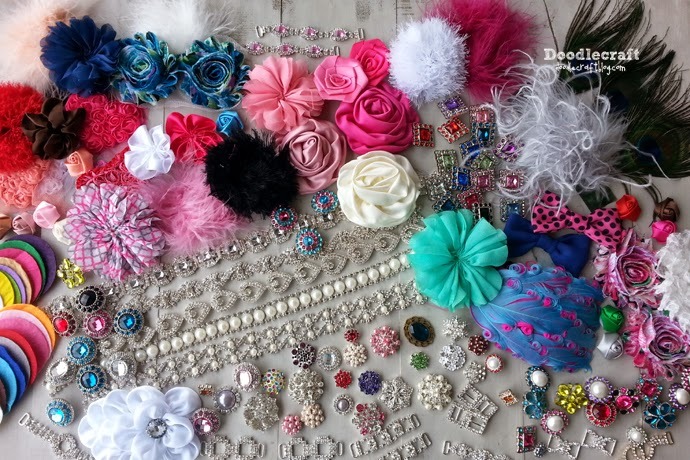 Shabby Chic Interchangeable Boutique Hair Bow clips, headbands or pins! bling, fluffy, feathery, sheer, dazzling fun! Where, oh where, to start!? I decided that a slew of LOVE colored hair bobs was in order. A good rule is the rule of 3's. You nearly can't go wrong with a grouping of 3. So, for about $5, you can make a super cute Shabby Chic headband hair clip! To start...take 2 felt circles. No worries about the wrinkles...or color! And TWO 1 1/2 inch pieces of 1/4" elastic. Carefully cut 4 slits in one of the felt circles. You can kind of see the cuts in the felt, right? Now slide your elastic strips into the slits. And hot glue the ends down onto the felt. It will look like a cartoony pig nose. Now hot glue the other felt circle on the backside...where you glued the elastic down. Now you can add whatever clip, pin or headband you want! Just slide it on the elastic! And pressed the marabou feathers on the glue. Carefully, because feathers can still leak glue through them. I totally love this! And glue this flower on the last third section of the felt circle. Hooking on a pin...sliding on an alligator clip or french clip...you name it! I love the combination of 3 different textures and the bling! You can't go wrong with a combo like this! Next, a shabby heart bow! I used white grossgrain ribbon in 2"
between a marabou puff and then hot glued on the heartlet and a small flower button! Same felt circle backing makes this a clip or barrette! Next, nearly the same idea! It's so big--I love it! It's like a fascinator or old style hat! pink pearly beads and a shabby flower! One of my favorites, is also super simple! Some days you just feel like a simple flower, right? A marabou puff, a chiffon flower and a Dahlia flat back rhinestone. Another one nearly the same but in pink! With the marabou centered under the flower instead of offset. I love the pearl and rhinestone plastic centers! They are so pretty--and don't look cheap! This would look great with a pin back as a brooch on a lapel or bag too! And last, another shabby flower headband! Perfect for the day of love! So many adorable hair flowers! it will be perfect for formal dances or dressing up! 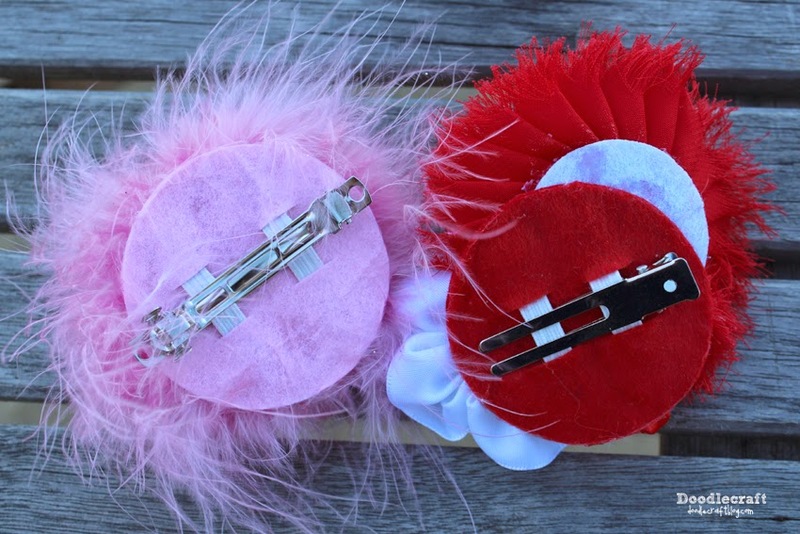 These are so fun to make and are the perfect gift for any little lady! Great for Baby Shower gifts and perfect for tweens, teens and adults! Here's a great way to store your hair bows too!